So, who’s more inept – Kiehl Frazier or his coaches? MSU coaches said the defense was able to take Frazier, who had 18 yards passing in the first three quarters, out of comfort zone because of the “trickle down effect,” which allowed the linebackers to let the rest of the defense know what was coming as Frazier shouted signals. “It makes our job as coaches so much easier when (MSU senior linebacker) Cam Lawrence is signaling over his head every time they were calling a pass,” MSU co-defensive coordinator/linebackers coach Geoff Collins said Monday. Lawrence and sophomore Matt Wells figured out the Tigers’ play calls, which enabled the MSU secondary to know how many players it needed at the line of scrimmage by the end of the first quarter. That, um, sounds like a problem. Especially when you’ve got a green quarterback who doesn’t have the responsibility of being able to check out of plays that his coaches have telegraphed to the other team’s players. I’m sure Chizik’s jumping right on that sucker this week. Good thing he’s got a Sun Belt team coming in to give him the opportunity to work the kinks out. Oh… wait a minute. There’s something interesting tucked into this piece about Marlon Brown. … But his play against Missouri showed off the improvements Brown made during offseason work with Georgia’s new conditioning staff, particularly speed and flexibility coach Sherman Armstrong. That’s the first specific shout-out I’ve caught from Richt about the new strength and conditioning team. It seemed to me that the team as a whole looked to be in better physical shape than Missouri in the fourth quarter Saturday night. And there’s no question Brown seriously stepped up his game. So I’m wondering: are we seeing some real progress on this front? You can’t win in the SEC without labelling your clothing. 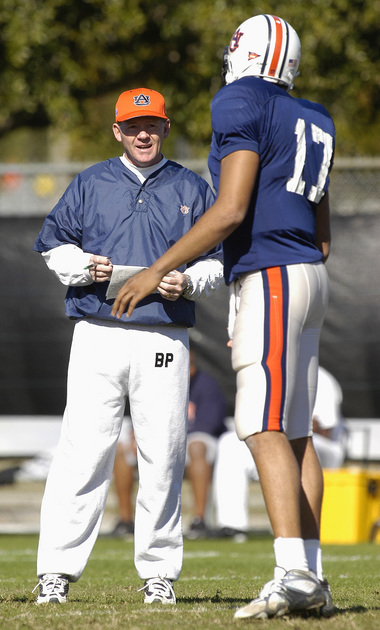 … and I can’t help but wonder whose idea it was to put Petrino’s initials on the pants. His? Tuberville’s? I mean, I know all those white sweatpants look alike, but still. You think they were keeping track of the coaches’ underwear the same way? We all know the hundred-dollar handshake has long been a part of doing bidness, but you don’t often hear of it spoken about publicly. Steve Spurrier goes for his 200th collegiate coaching win this Saturday. As he’s 45-0 against non-BCS opponents, he won’t break a sweat getting it. “I hope you budgeted extra money for defending (NCAA) violations.” You get one guess whom that quote is about. Uncle Verne offers a few thoughts about the early SEC season here. For some inexplicable reason, Jeff Long thinks a “Red Out” for Arkansas’ game against Alabama is a good idea. Go figure. Bruce Feldman’s ten most surprising stats of the early season has some good information. The UCLA numbers are eye-popping. Georgia-Missouri was a big hit, TV-wise. This is non-football related and definitely NSFW, but it’s the funniest thing I’ve come across on the intertubes in the last week. I’m curious what you all think of this. With 3:18 left in the fourth quarter, freshman defensive back Trae Elston went high and hard on a Miners wide receiver near the goal line, although the play didn’t draw a flag. It did, though, draw the attention of the SEC. Commissioner Mike Slive announced Tuesday morning that Elston has been suspended for the Sept. 15 Texas at Ole Miss football game. The release stated that the one-game suspension was “the result of a flagrant and dangerous act” on the part of Elston, and used both the NCAA’s rulebook and the conference’s own constitution to explain the reasoning behind the punitive measure. It’s a close call. And I get that Slive is trying to send a message. But I’m having a hard time seeing that as flagrant. Just wondered what you guys see there.